The XVIII Mendeleev Congress on General and Applied Chemistry took place in Moscow 23–28 September 2007. The Congress celebrated the 100-year anniversary of the Mendeleev Congresses in Russia and the forthcoming 175th birthday of Dmitry Ivanovitch Mendeleev in 2009. The congress was organized under the auspices of IUPAC, and the President of the Russian Federation, Vladimir Putin, and the first deputy to the chairman of the Russian Government, Sergey Ivanov, both sent warm greetings to the participants. The president of IUPAC, Bryan Henry, welcomed the Congress on behalf of the global chemical community, and the mayor of Moscow, Jury Luzhkov (a professional chemist by trade and education), in an emotional speech stressed the importance of chemistry worldwide and specifically for Russia and Moscow. 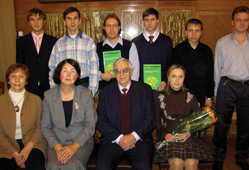 The winners of the IUPAC Poster Prize for young chemists and the winners of the Special Prize for young chemists in the session “Catalysis, Petrochemistry, Refining,” shown together with Oleg Nefedov (front row, center), president of Mendeleev Congress, and Natalia Tarasova (front row, second from left), chairman of the congress’s International Advisory Committee. More than 3 850 scientists—among them more than 1 000 young scientists and students—came to the Russian capital for the conference, representing 53 Russian towns and 7 countries in the Commonwealth of Independent States. Numerous representatives from the Russian Academy of Sciences, from Russian ministries and other governmental organizations, and from national chemical societies abroad were also in attendance. The program included 17 plenary lectures on mainstream directions in fundamental chemistry, innovations in chemistry and chemical technology, and chemistry education. Lectures by Nobel Prize laureates J.-M. Lehn (France), R.R. Schrock (United States), and J.I. Alferov (Russia) drew particularly large crowds, as well as media attention. All told, 430 scientists made oral presentations during 77 sessions of 9 sections and 5 satellite international symposia. In addition, 2 173 posters (representing 13 500 authors) were presented, and 3 560 abstracts were published in the congress proceedings. The most advanced directions in research, the newest approaches, and various perspectives on the different branches of chemistry were discussed at the conference, including nanotechnology, space research, synthesis of the new elements of the periodic table, energy and resource conservation, renewable energy sources, and health care. A symposium on “The Social Responsibility of Chemists: Green Chemistry” was particularly well attended, and aimed at disseminating new educational materials related to responsible stewardship and addressed all aspects of chemistry (see Project Place p. 23; IUPAC project 2006-043-3-050). The state of chemistry education was also thoroughly discussed, including current educational practices and innovations, the public’s understanding of chemistry, chemistry education for gifted children and for modern industries, high school chemistry, and university-level chemistry. In addition, two roundtables dealt with the “chemistry” of megapolicies and the problems of the interaction of the scientific and educational communities with business. Representatives from the Moscow government, oil and gas companies, and the academic end educational communities were trying to find consensus on these important issues. The congress also approved recommendations on the development of chemical science, technology, and education in Russia. And the participants supported IUPAC’s initiative designating 2011 the International Year of Chemistry. Natalia Tarasova <nptar@online.ru> was chairman of the XVIII Mendeleev Congress’s International Advisory Committee. She has been a member of IUPAC’s Committee on Chemistry Education since 2002 and was recently elected a member of the Bureau.